Celebrated Hang player, percussionist, producer and composer Manu Delago releases his third solo album on 27th January, followed by an extensive tour from February. ‘Metromonk’ finds this boundary-testing artist distilling and delicately exploring extremes of dynamics and mood; manipulating the Hang in experimental and inventive ways, the many voices and tones of this rare instrument are given top billing among a minimalistic palette of beats and acoustic sources. “I wanted to create electronic soundscapes that are generated through live performance and feel organic and human”, Delago explains. Almost all of the effects on the Hang are applied live during one-take performances. “It may initially sound like programming or production, but it’s all happening in the moment”. Additional touches come from vocalists Douglas Dare (Erased Tapes), Pete Josef (a Gilles Peterson Worldwide Award nominee) and Isa Kurz, and trumpeter Erik Truffaz (Blue Note), while Matt Robertson (Björk, The Streets, Bat For Lashes) reprises his regular role as co-producer. Lead single “A Step feat. Pete Josef” brought the first taste in November, along with a captivating animated video, and saw Delago booked for live sessions for Gilles Peterson’s Worldwide FM, Resonance FM and Sofar Sounds, also gaining a lead review in DJ Mag (9/10) and radio play from BBC R3, Virgin Radio, KCRW and beyond. This new music builds on an illustrious spell for Delago, whose ambitious 2015 LP ‘Silver Kobalt’ won over tastemakers from BBC 6Music’s Tom Ravenscroft and Don Letts to Radio 2’s Alex Lester, Nitin Sawhney and Jamie Cullum (who snapped him up for a Maida Vale session), and was also loved by i-D, Clash and DJ Mag; the Silver Kobalt Tour boasted 80+ thrilling live shows with his band, Manu Delago Handmade. Meanwhile, the Austrian prodigy maintained his schedule of engagements as a go-to musician for some of the world’s leading artists. Recording and performing with Björk, and drumming for The Cinematic Orchestra, he also co-wrote Anoushka Shankar’s ‘Land Of Gold’ LP and is a band member on her world tour, rocking concert halls, festivals, BBC 2’s Later… With Jools Holland, and even Spain’s Alhambra Palace. 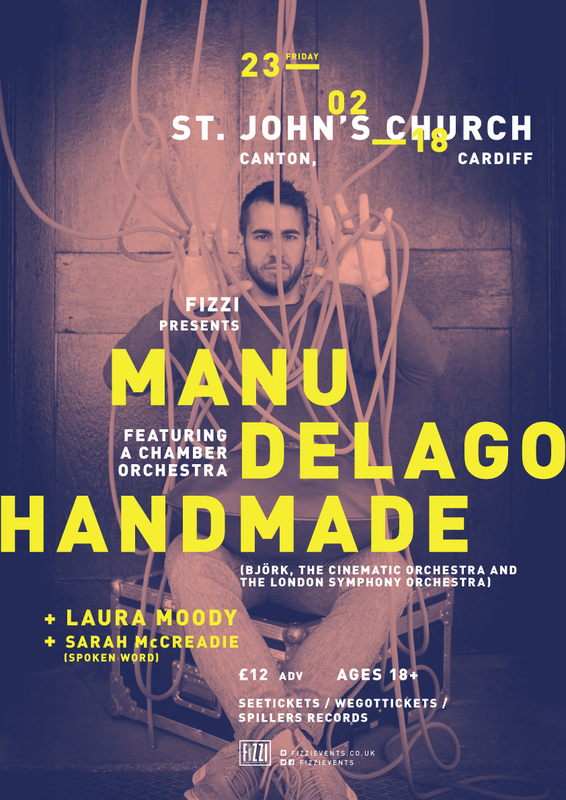 The world’s leading Hang player, Manu Delago has had over five million YouTube views and featured heavily in BBC Radio 4’s recent documentary on the instrument. While his last album saw him diversifying with multiple layers of synths, electronic production and a wide range of instruments, ‘Metromonk’ restores his virtuosic Hang playing to centre stage. A serene atmosphere is set by a compelling vocal and Hang combination “A Step feat. Pete Josef”, before the unusual slide Hang sound on “Between Oil And Water”, ingeniously generated using a rubber mallet, is garnished with the story-telling trumpet of Truffaz. Beyond the focused, one-take immediacy of “Freeze” lies the minimalistic “Pointillism”, made up of thousands of small dots played on a muffled Hang, each triggering a chain reaction of echoes. In its deft treatment of temperaments and dynamics, the album diverges into two sections, which Delago thinks of as the inner world of head, heart and soul versus the lively hips and feet – or, alternatively, mountains versus metropolitan city (the two main geographical backdrops to his life). This meeting of worlds is reflected in the album title, which he hit upon when he saw a Buddhist monk gliding through the busy streets of Bangkok.